You can use the Interactive Audit Report Builder to create a report that displays a record of various activities performed by users in Dentrix Ascend. 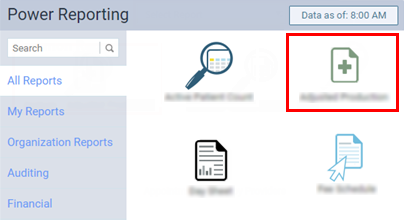 On the Power Reporting page, click (or tap) the Interactive Audit Report Builder icon. To customize the report, click (or tap) the Toggle Edit link. Using the interactive report builder tools, add data fields to the layout, and set up filters as needed. Export the report as a .pdf, .xslx, or .csv file, or view the report as HTML.